Conservation banker responsible for long term operation of the property to benefit the species in perpetuity. 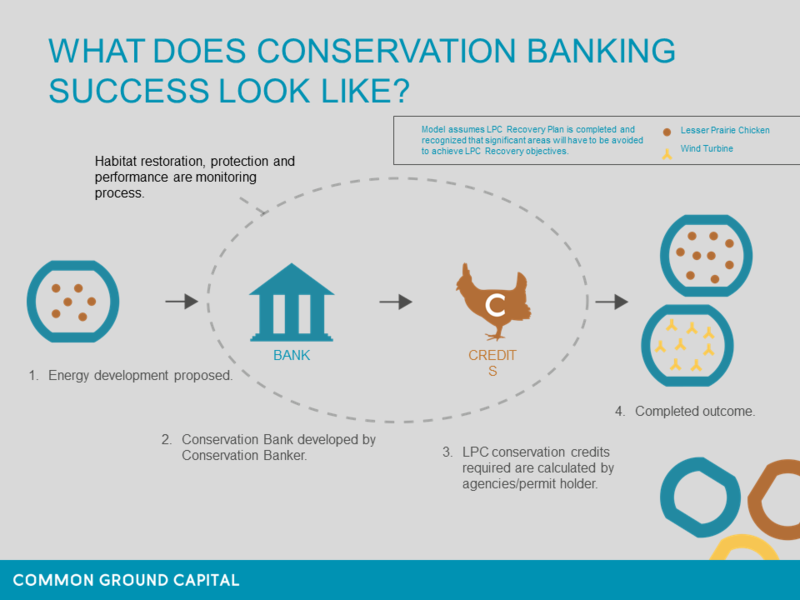 After a rigorous site selection search, Common Ground Capital (“CGC”) approaches the landowner to educate him/her on the conservation banking business model and ascertain interest. Terms are negotiated that result in the parties executing an agreement stipulating basic business terms and conditions that allow CGC to perform detailed site due diligence to confirm whether or not the site is indeed suitable to achieve the conservation objectives for the species of interest. Assuming the site is acceptable, the conservation banker facilitates an introduction to prospective easement holders and the terms of the conservation agreement are negotiated. CGC develops a detailed management plan and designs requisite financial assurances for the property and works with the US Fish & Wildlife Service (“USFWS”) to seek conservation bank approval. The development process could take months or in some cases years. CGC bears the expense of all development activities. Once the conservation bank is approved and credits are released for sale by the USFWS, CGC has secured a customer or customers for the credits, the credit transaction is consummated, the conservation easement is recorded at the county courthouse and the proceeds from the credit transaction are distributed. This process may replicate itself over multiple phases in some cases. Typically, industry parties seeking to transfer liability from “incidental take” under the Endangered Species Act will seek a take permit under Sections 7 (federal nexus) or 10 (no federal nexus) or in the case of the Lesser Prairie Chicken under a Candidate Conservation Agreement with Assurances or Section 4(d) of the ESA. In the case of Section 10, the most common method of achieving an incidental take permit (“ITP”) is via the creation of a Habitat Conservation Plan or “HCP”. Recently the USFWS has strongly advocated for industry wide HCPs or CCAAs and strongly dis-favors project specific HCPs or CCAAs due to limited USFWS personnel resources and greater efficiencies enjoyed by industry wide permits. In rare cases, industry participants may secure a quasi ITP via participating in a conservation plan approved by the USFWS under Section 4(d) of the ESA. This is currently the situation with the Western Association of Fish & Wildlife Agencies “WAFWA” Range Wide Plan “RWP” for the Lesser Prairie Chicken at the present time (note: 4(d) rule was eliminated as part of the 2016 de-listing). The timing of securing a path to achieve ITP relative the listing decision date is critical for industry participants in order to avoid project delay or potentially even work stoppage. If your company has not determined and secured the ability to achieve “take” at the time of a listing decision or after a listing decision has occurred for an endangered species project delay is a virtual certainty. Once a Section 7 or 10 permit is achieved or inclusion into a conservation plan under Section 4(d), purchase of credits from conservation banks, or other approved mitigation options, can occur to transfer liability away from the project. Purchase of conservation bank credits is also an option under non ESA/voluntary market structures.